There is definitely a competition going on for African American televison viewers. Recently, Bounce TV launched which is a lifestyle channel cartering to African American viewers, but now there's talk of another channel being launched. The channel is called KIN TV and it's set to launch late this year or early next year. (EURWEB) The competition has already begun for new African American owned television network Bounce TV which just opened its doors this past Monday. Another network is about to make its debut soon. KIN TV, rumored to possibly be backed by Metro-Goldwyn-Mayor Studios, is expected to launch some time before the year is up, if not then, by the summer of 2012. Its programming will rival that of the first broadcast network (over the air – not cable) for African Americans, Bounce TV. The network will be marketed as a “diginet” channel and will take the lifestyle approach to programming choices, including topics of travel, cuisine, parenting, work and relationships. 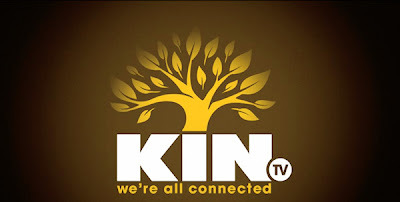 KIN TV will offer a “wide range of programming designed to entertain, inform and inspire a broad audience of modern African-American viewers,” according to a video presentation. KIN TV, according to reports, is headed by Basil Street Media’s Lee Gaither, who also helped launch TV One. African-American television programming is one of the most perverted modern representations of equal-opportunity in practice in America today. As a proud African-American, I find this equally as offensive as I find the UNCF. This is literally the majority of our community stating "We need some special treatment because we are different eg. "lesser than" most of the rest of the American population." I was offered several College grants based solely on my skin-color, and I could not help thinking that by accepting these unique opportunities, I was accepting the idea that I somehow needed more help than a white person. I earned a Masters Degree without any 'special' help. To me, accepting financial help based on my skin color is no better than being back on the plantation!!! What about all those poor white people in Kentucky that can't afford school? There is not United Poor White Folks College Fund? In my opinion a purely African-Am...black! television channel is equally racist as the Klan! I happily watch ABC, NBC, and CBS just like most folks and I have never felt left out. By stating that we need our own channels, we are stating that we are somehow not equal as a people. Let us not forget the words of Dr. King people! Judged by our character, NOT the color of our skin. I will bet this post will be followed by a dozen posts calling me Uncle Tom. And they will all be ignorant statements. Bootstraps folks! Pull em up! @ anonymous, I agree with you in some respects and in some I do not. I truly believe that "separate is not equal." So any time a specific group is separated out then the implication is that group is not equal and many times considered less than. At the same time, I think that certain programs are helpful in leveling the playing field. There wasn't fairness in the system and alot of unfairness still exists today and it needs to be addressed. The UNCF is just one of the programs that attempts to level the playing field by providing funding for higher education. The last I knew UNCF was a private fund so the dollars can be allocated as the donors see fit. Thus I don't believe that there is anything wrong with fund in and of itself. I think it's great to realize that there are others in this country that have been marginalized and disenfranchised. Black folks are not the only ones suffering. Many programs have evolved to include other groups. As for television programming, if there were a diverse lineup of shows on the major networks, then there wouldn't be a need for "separate" network. There are some aspects of our culture that is unique and should be embraced by our country. I don't think there is anything wrong with acknowledging and catering to our culture particularly when the mainstreamers ignore it. Now I won't say that the programming that these new networks offer are always to my liking as a black person. But I won't argue that point right now.